Polar Baby Buff® is a multifunctional accessory for any outfit and which performs well in any weather conditions. Polar Buff® Baby is a multifunctional accessory for any outfit and which performs well in any weather conditions. it is made from stitchless microfibre which help keeps an adequate body temperature irrespective of whether the sun is shining, a strong wind is blowing or it is freezing. Additionally, the Polygiene technology has been used in this product, which allows moisture to evaporate on the outside. This Buff model includes a special Polartec® Classic 100 sleeve, which provides even better protection against the cold, snow and wind. 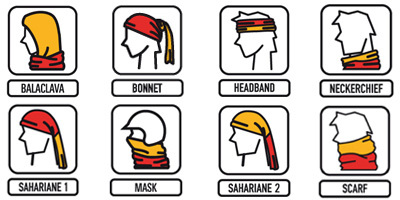 Thanks to its multifunctional nature, Polar Buff® Baby can be used as a cap, kerchief, balaclava, mask, scarf and in many other ways. Polartec® fleece has a lofted fiber structure that creates thermal air pockets to prevent convective heat loss and regulate core warmth. This breakthrough design construction provides the highest warmth per weight ratio for insulating materials while remaining highly weather resistant, durable and soft to the touch. A soft double-sided face gives fleece the versatility to integrate with layered systems, whether worn directly against the skin or on top of other fabrics. The hydrophobic properties further enhance the inherent ability to repel water, resist saturation and dry quickly.